183-185 Dwight St: We call it our "B&B" (Bed & Breakfast). This is a four unit building comprised of 2 one bedrooms and 2 two bedroom. The apartments feature hardwood floors throughout, open kitchen space, high ceilings and large windows. This building is great for people looking for an outdoors space, there's a private patio in the back of the building. No utilities included. Cooking and heat are gas. Cat friendly building. 2 bedroom flat $1,400 Beautiful 2 bedroom apartment on the 2nd floor of a 2 story historic house. The apartment features a combination of hardwood and tile floors, updated kitchen with dishwasher which opens to the living room. This is a fantastic apartment, perfect for anyone who loves historic homes with modern touches! 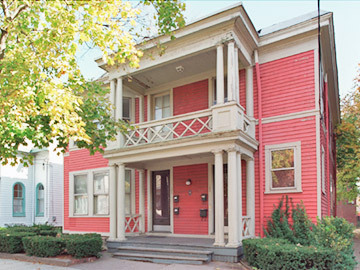 2 bedroom flat $1,450 Beautiful 2 bedroom apartment on the 2nd floor of a 2 story historic house. The apartment features a combination of hardwood and tile floors, updated kitchen with dishwasher which opens to the living room. This is a fantastic apartment, perfect for anyone who loves historic homes with modern touches!